This 97-year-old cage holds one lion that spends most of his time sleeping, a zoo spokesperson said. 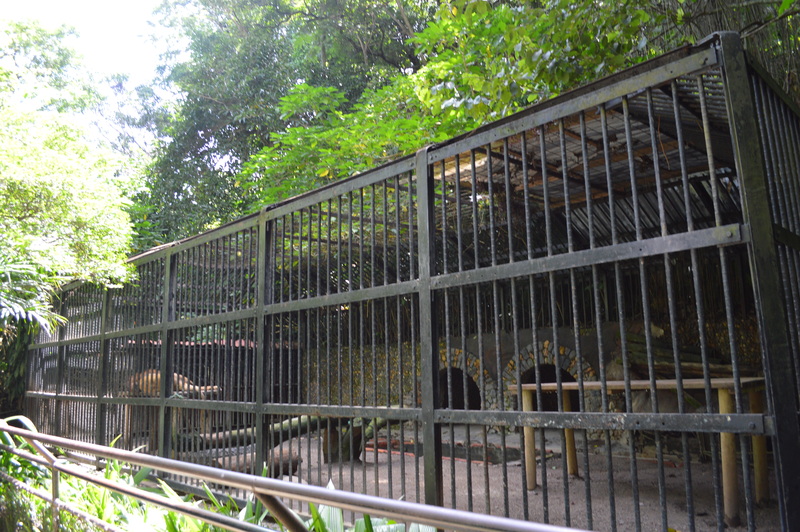 SAN JOSÉ, Costa Rica – The once popular Simón Bolívar Zoo in San José has been slated to close by the Environment Ministry because of poor conditions. Zoo administrators are fighting back. Lawyers representing the zoo have taken the case to the Supreme Court to halt the closure of the animal refuge center, administered by Fundación Pro Zoológicos (FUNDAZOO), a non-profit organization. The government owns the property located in Barrio Amón. “It is a difficult relationship, but we have a contract,” said Eduardo Bolaños Vargas, publicist for the zoo. The Ministry of the Environment (MINAE) planned to close the zoo in May 2014, said José Joaquin Calvo, wildlife manager for the National System of Conservation Areas, Sistema Nacional de Áreas de Conservación (SINAC). But the contract automatically renewed until 2024, according to Bolaños. Animal rights activists and ordinary citizens have accused the zoo of animal abuse, and Environment Minister René Castro publicly joined in the criticism. Bolaños said the cages have a function in the zoo and that taking them away wouldn’t work. There are 300 animals in the zoo, including 60 different species. Among them are 28 birds and five caged larger felines. The confined animals aren’t the problem –– it’s their conditions and the state of their cages. All the birdcages are new, said Bolaños, but the rest of the cages are as old as the zoo. The lion is one of those animals that live in a 97-year-old, small iron-barred enclosure too small for its size. Activists have accused the zoo of violating the law. Many of those taking a stand against the zoo have pointed to Law 7317, La Ley de Conservación de Vida Silvestre, The Law of Wildlife Conservation, signed earlier this year. “These are animals destined to die. Here we keep them alive,” said zoo veterinarian Randall Arguedes. The only veterinarian for the zoo, he has worked at the park for 11 years. 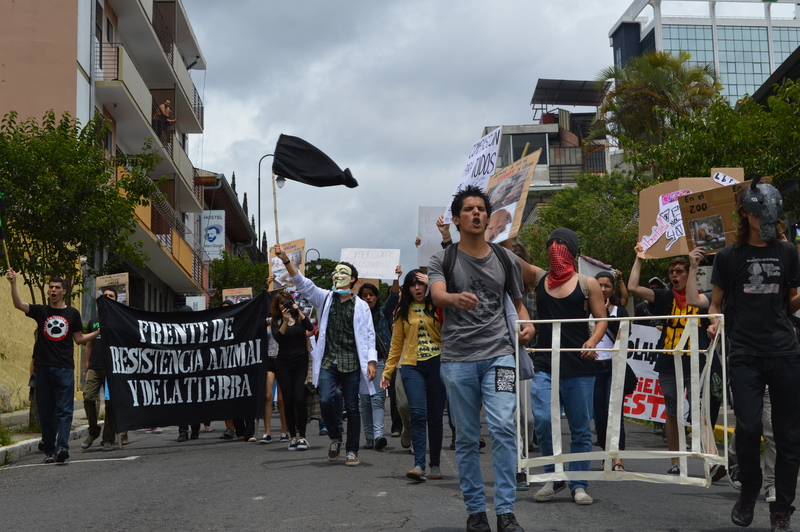 “There are all kinds of exploitation of animals,” said Edgar Samper of the collective Frente de Resistencia Animal y de la Tierra, one of the protest organizers. Posters included pictures of the conditions of certain animals in the zoo. Signs showed a picture of the crocodiles without water inside their enclosure. Protestors took to the streets July 28 to voice their concern about conditions at the zoo. A visit to the zoo on a Wednesday in July seemed to substantiate the accusations about the crocodiles’ lack of water. But Bolaños said that on Wednesdays the crocodiles have little water in the morning because the cage is cleaned and it takes more than two hours for it to be filled. Marchers met in Parque Central in downtown San José where they made signs, masks, and prepared for the trek to the zoo, less than a mile away. At 11:30 a.m. protestors scattered over one of the busiest streets in the country, Avenida Segunda, then passed in front of the National Theater into the pedestrian street Avenida Central, and stopped in front of McDonalds. They performed a skit depicting animal abuse on meat farms. The girl portraying the animal was thrown around, kicked, hogtied and even tagged on her ear. The actress bled profusely through the tagged paper on her ear. Drops of blood accessorized the upper right of her earth-tone shirt. But she kept on going. This was to simulate the abuse an animal endures on a farm, said Priscilla Zamora, an active member of the collective that organized the event. “Murderers! Murderers!” yelled protestors on their way to the zoo. Marchers finally met with the white-walled fortressed zoo. There, they occupied the entrance. Park security came out to quiet down and attempt to move the protest elsewhere, but they were not prepared for such a loud, energetic crowd. Local law enforcement stepped in to create a blockade between the zoo and the protestors. That day marked the Simón Bolívar Zoo official celebration of the facility’s 97 years. Park visitors had to cross the picket line, where they were met with questions about their visit to the zoo. Some visitors who were leaving argued and insulted the activists. Inside the zoo behind an wrought-iron fence visitors stood with balloons, cotton candy and park memorabilia and watched the vociferous rally. Some took pictures and even yelled back at protestors. Once inside the zoo the commotion outside wasn’t noticeable, even during the altercation, Bolaños said. But witnesses refuted the police account. What began as a non-violent protest escalated to a physical altercation between the police and demonstrators in front of the zoo. Law enforcement officers pushed and chased certain activists in the crowd. It ended with three arrests of activists. Police said those detained kicked police cars and made a police officer bleed from an altercation. Two of the three were fined and released later that evening, and one was facing charges. After the police arrests, activists were shaken up but continued in front of the zoo, Zamora said. The zoo’s only funding is entrance ticket sales, which must cover all the expenses it takes to run the park, said Bolaños. That includes salaries, events, animal food, animal health and site maintenance. “If we get an owl with an injured wing, the surgery alone will cost around 200,000 colones, (about $400),” Arguedes said. Adding three to four mice daily for a healing time of about four months adds up, he said. This scenario is not uncommon, Bolaños said. “The zoo functions as a rescue center. Most animals come here injured. People bring animals from the wild. In fact we try to return them,” said Bolaños. He shared anecdotes about people leaving animals in front of the zoo. “At times people leave all kinds of turtles in the fresh water turtle area,” Arguedes said, increasing their daily turtle count. He said the zoo has four main functions. It works as a rescue center for animals, an educational center, a research center, and most importantly, he said, it has a social function. “This is one of the more economic theme parks for families of low income who can’t travel or go to other parks. This is a form of social work,” said Arguedes. Bolaños added that those who can’t travel too far and explore the country’s national parks attend the zoo to see Costa Rica’s wildlife. “We will continue to work under the same condition unless we close,” he said.